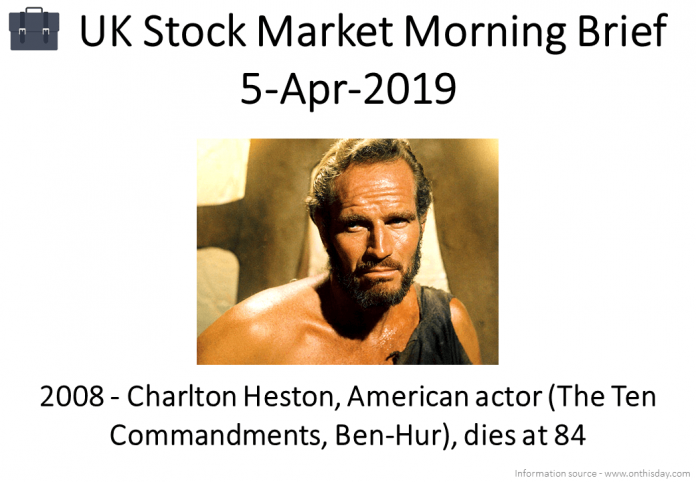 My Monthly Recap For April 2019 covering all my Buys and Sells from the month of March is now available here. 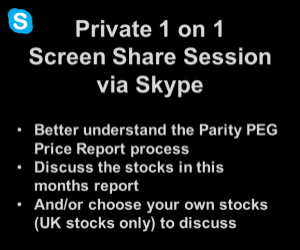 The Parity PEG Price Report For April 2019 covering 20 UK Stocks including all those I bought/sold in the month of March is now available here. Trading Update For The 12 Months To End May 2019 – Brexit blamed for EBITDA of between £4.5m and £5.0m. Not sure how much of a miss this is or how much of it is built into the recent halving of the price already – I remain on the side-lines. Trading Update For The 12 Months To End March 2019 – Expects FY Revenue to be up 6% with Underlying PBT up 10%. Remains cautious on outlook due to Brexit, also notes a £2m non-cash hit from some deferred something or other. Gets more tempting as it slowly edges lower but not enough here yet for me due to sector concerns. Trading Update For The 12 Months To End March 2019 – Revenue up 5% (CC), expecting a -£0.6m FX hit but FY PBT (before exceptional items) to be in-line. Down from 480p or so since my last comment, I still can’t see the justification for a PER of 20+ here. As always, all comment most welcome!